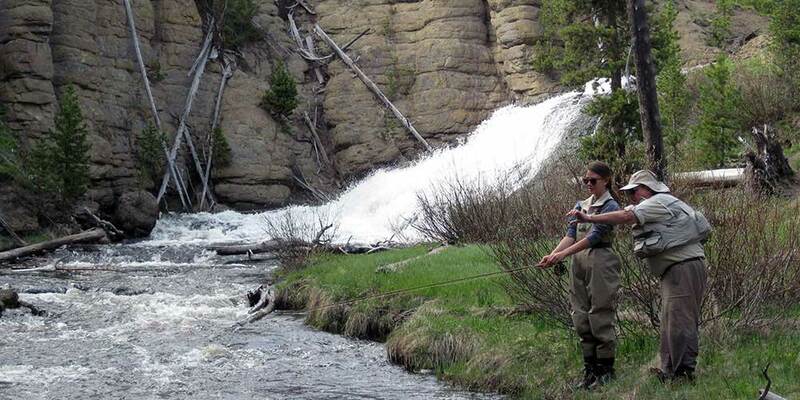 Parks Fly Shop Beginner fly fishing trips in Yellowstone. 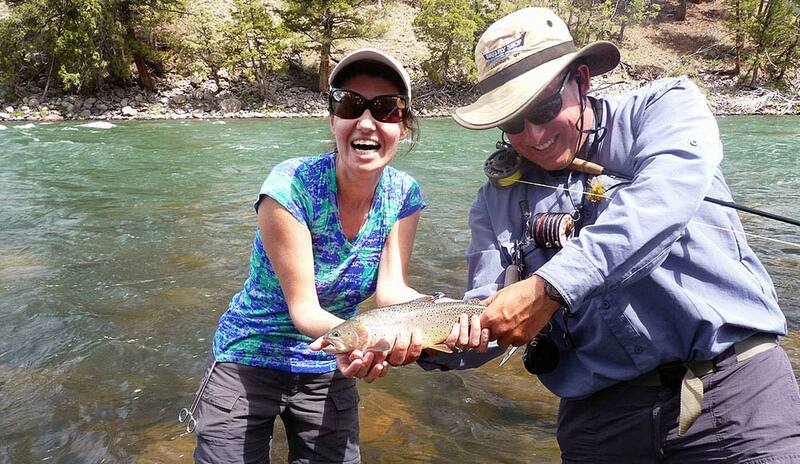 Learn to fly fish in yellowstone. 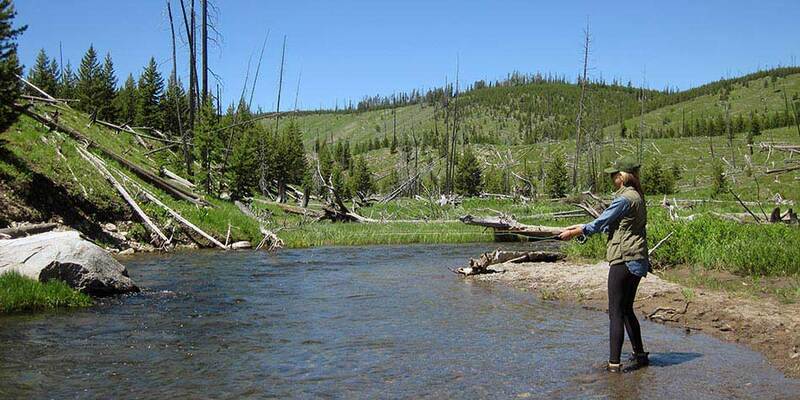 Fly fishing school in Yellowstone. Family Fly fishing yellowstone. Richard Parks instructing a beginner fly angler. 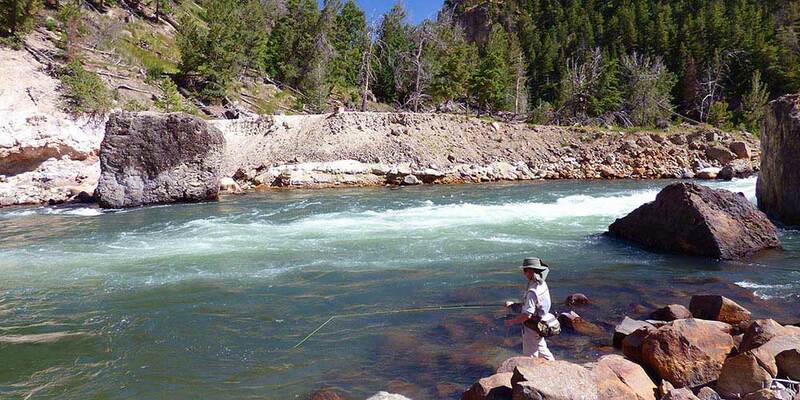 The Yellowstone area is a great place to learn how to fly fish. Parks' Fly Shop has been teaching beginners how to fly fish since 1954, and roughly a quarter of our clients are beginners, and all of our guides teach dozens of first-timers every year. While we can take beginners on any of our trips that are available (not all trips are available all-year), specific trips at specific times of year are better-suited to beginners than others. On this page, we go over the options that are best if you're brand new to fly fishing, and discuss them from a beginner-centric perspective. The trip you should book depends on a variety of factors: when you're here, whether there are any young kids in your group, whether you want to focus on learning as much as you can or just catching fish, and whether you're up for a hike or a float trip. Do you have limited time (or money)? You might also be interested in our Fly Casting and Fishing Lessons. Looking for more information on fishing suitable for beginners, whether you're fishing with a guide or not? Check out the Beginner Water page on our FREE Fishing Info Site, which contains as much information as many guide books. Recognizing the signs of a fish striking, often both with dry (surface) flies and with subsurface flies. As is the case with all of our guided trips, we include the guide service, water, lunch on full-day trips, flies, rod/reel combos (if you don't have your own yet), leaders and other terminal tackle, and wading gear appropriate to the season and weather: waders and wading boots when it is cold/wet, or just wading boots if it is warm. In general, you should plan to wear clothes you don't mind getting wet such as long-sleeve hiking/outdoor pants, long-sleeve tee shirts, and so on, since it is much easier to hike without wearing waders and because warm temperatures are common when most beginners go fishing, making getting a little wet feel good. We do not include any personal attire (including hats, raincoats, and polarized sunglasses, all of which are required), Yellowstone Park entrance fees, fishing licenses, or guide gratuity. Please check our Guided Trip FAQ for more details on what we include and other policies. Click the tabs below to learn more about each type of trip that makes sense for beginners. Approximate available dates are given in parentheses. The rates for these trips are identical for beginners and for experienced anglers. On this page I've simply described them in terms of what they offer specifically for beginners. Trips are listed in order of popularity, most to least. Rates, policies, and so on are described on this page. Rates for trips with beginners are identical to trips with experienced anglers. 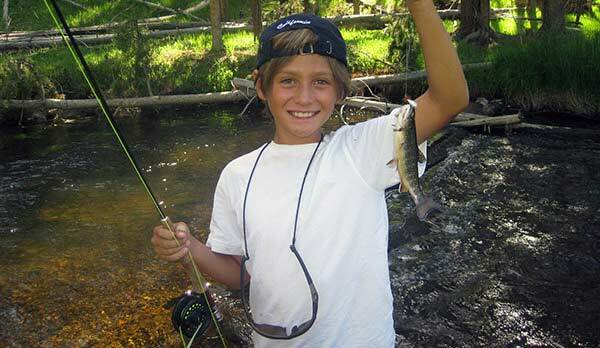 Young angler with brook trout. Back in the late 1800s, early park administrators wandered about the park interior stocking various species of trout, especially in waters that had been isolated by waterfalls and were therefore originally fishless. Many of these were small, often slow-moving streams on the park's central plateau that were stocked with brook trout. This original stocking created massive populations of small, wild brook trout in many small streams and headwaters of several rivers. Today, there are several dozen waters absolutely stuffed with these fish, "brookies." These populations are in our opinion the most beginner-friendly fish to be found anywhere on Earth. To take advantage of these fisheries, we've developed a beginner specialty half-day trip we've taken to calling our "Beginner Brookie" trip. Beginner Brookie trips are half-day public water walk-wade trips. They all involve hikes in the 1-2 mile range each way to access unpressured water and easy fishing, usually traversing gentle terrain with good footing, though if you are up for a more aggressive hike, even more fisheries and some lovely waterfall viewing become possible. These hikes give us access to a wide range of small waters where the fishing is easy, the casts are short, and the wildflowers are pretty. On our Beginner Brookie trips, most clients get between ten and fifty bites apiece on an average day. Some beginners catch thirty or more fish, and just about everybody catches at least a few. This easy fishing, combined with pretty hikes, almost no competition from other anglers, and the knowledge our guides have of the maze of small streams and river headwaters where the fishing is best, makes these our most popular trips for beginners. We were the first fly shop in the Yellowstone area to begin focusing on these types of trips, and other shops and outfitters have admitted to us that they follow us around to learn the best brookie waters. 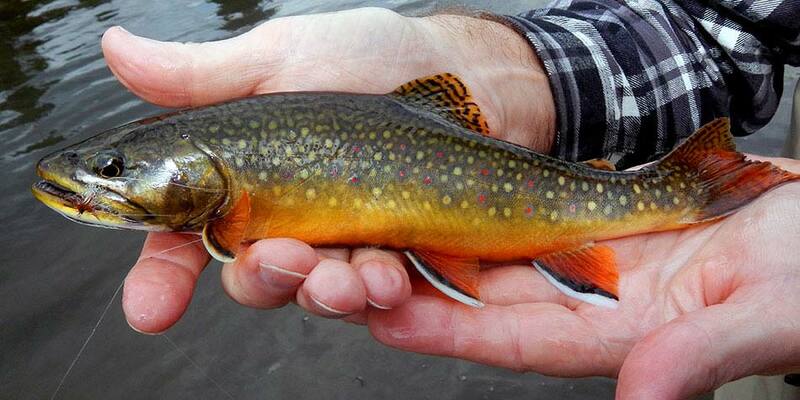 Brook trout are aggressive, small, and very pretty. This one is both prettier and an inch or two longer than most. Photo by Ben Jewell. Who Should Book a Beginner Brookie Trip? Beginner Brookie trips are ideal for groups containing children aged 8-12, for anyone who wants to be almost certain of catching several and often quite a few fish, for those who want to mix a little hiking with their fishing, for folks who are impatient, and for those who just want the experience of fly fishing, without knowing for sure if they'll do it again. They're also great choices for anglers with experience fishing with conventional tackle (lure or bait) who like fishing for panfish such as bluegill, since brook trout are basically the panfish of the trout world and behave similarly. Finally, Beginner Brookie trips are far and away our best option for large parties who wish to stay together, whether three anglers with one guide or 4+ anglers with multiple guides, since the Beginner Brookie streams are really the only areas where three or more beginners fishing more or less together can expect to do very well. Beginner Brookie trips are very bad options for anyone who is not physically fit enough to walk 1-2 miles each way, usually on decent game trails or even officially-maintained trails, but with some areas of marsh and some uncertain footing and wading while on-stream. We are very serious about this. While there are some easy-access brook trout fisheries right next to the road, they usually get fished out very early in the season and we expect even experienced anglers to do poorly fishing them through most of the season. We also suggest other options for beginner teens and adults with a lot of patience and a desire to focus on learning rather than just catching fish and enjoying the scenery of the hike, for at least part of the day. For such beginners, a full-day trip that perhaps includes a morning session chasing brook trout and an afternoon session chasing larger fish, or even a full-day targeting larger fish, makes more sense. Finally, Beginner Brookie trips are not a good fit for anglers who will get bored quickly catching hand-size and smaller fish and would rather try to catch a far smaller number of larger trout. Because winter snowpack is high and winter snowmelt lasts well into summer in the stream drainages where brook trout are most often found, we cannot offer Beginner Brookie trips before at least mid-late June, and some years as late as the first week of July. They remain a great choice from this point through sometime in early September, usually around Labor Day. After this point, brook trout begin preparing to spawn, which involves migrations far upstream into remote backcountry, putting them out of reach. This makes other trips a better option after early September. Virtually all Beginner Brookie trips take place on several small streams feeding the Gardner River and the Yellowstone River, in the northern portion of Yellowstone National Park. Once in a great while we may visit brook trout streams in the Gibbon or Firehole drainages, but these are rare occasions. If you happen to be staying inside Yellowstone Park, we will meet you for these trips either at Mammoth Hot Springs or near the fishing destination. We'll arrange this when we know about where we'll be fishing. If you're staying in Gardiner or north of Gardiner, we will plan to meet you at Parks' Fly Shop. Both morning trips and afternoon trips are available. Nowadays we generally suggest going in the morning to ensure we get to the trailheads before anyone else. We'll meet for these trips between 7:00 and 8:00 at our shop or a bit later if we're driving to meet you in the park. The main exception to the "morning is better" rule is during periods of cold weather, when the fish may be lethargic in the morning. If we're going int afternoon, we'll meet sometime between noon and 1:30. All Beginner Brookie trips run as half-day trips, though on full/day walk & wade trips with beginners we often fish Beginner Brookie streams in the morning followed by somewhere more challenging after lunch. Click the next tab for details. Standard walk & wade trips will produce fewer but larger trout for beginners than our Beginner Brookie trips. All of our public water walk & wade trips include plenty of time for instruction, so if the small fish and easy fishing of Beginner Brookie trips sound like they might not hold your interest, you should consider a standard walk & wade trip. Both full-day and half-day options make sense. 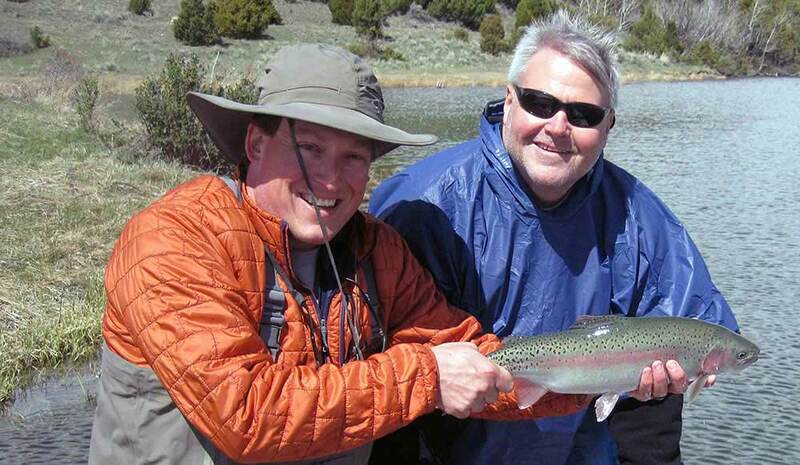 These trips generally take place in Yellowstone Park during the late May-November Yellowstone Park fishing season, while early and late in the year they may take place on the Yellowstone River. These trips are available year-round, weather and water conditions permitting, and are our most popular beginner trip option in the spring and early summer, before the Beginner Brookie trips are available. Destinations for our standard walk & wade trips suitable for eager beginners range from tiny creeks to alpine lakes, as do the types of tactics we might use, the fish we might catch, and the scenery and animal-viewing options available. This makes standard walk & wade trips our most flexible trip option. Unsteady on your feet and need to stay on a gentle stream near the road? We can do that. Would you rather make an aggressive hike into a brawling river canyon? We can do that too. For in-depth information on our walk & wade trips, check out the Walk/Wade Trips page. Which Beginners Should Book a Standard Walk & Wade Trip? Standard walk & wade trips are ideal for patient adults and teens who want more of a challenge than is usually provided on our Beginner Brookie trips and to learn to use several techniques on their day of fishing. They're also good choices for those who have had some previous fly casting instruction, or maybe even gone fly fishing once or twice without much success, as well as for groups containing anglers of wildly different skill levels, a beginner teen and an experienced parent for example. In addition, they are better choices for anglers with somewhat limited mobility, since some gentle streams near the road can fish acceptably well when they contain trout other than brookies. The fishing is harder on standard walk & wade trips than on Beginner Brookie trips. Beginner fly anglers who opt for a standard trip should expect to catch many fewer trout than on Beginner Brookie trips. They will generally be larger, however, and every once in a while even a rookie will get a big one even though we're targeting medium-sized fish. 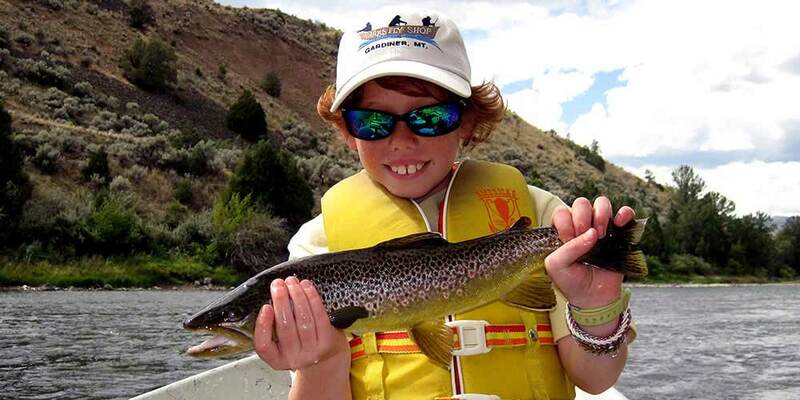 This more-difficult fishing makes standard trips poor choices for young kids and anyone else with a short attention span, as well as those who are just looking to check fly fishing off their bucket list and may not actually take up the sport. Standard walk & wade trips with beginners often include some time on rugged, large rivers, such as the canyon stretch of the Yellowstone pictured here. Most of our standard walk/wade trips take place in Yellowstone Park. Trips with beginners are no exception. Our specific fishing location will depend on a range of factors: the time of year, the physical condition of your party and how far you feel like walking, other interests your party has, and what's fishing well. In general, early in the season we'll fish somewhere in the Firehole or Gibbon River drainages, or perhaps on a small lake in the Yellowstone drainage. Once streams in the Yellowstone, Gardner, and Lamar drainages clear, we'll fish a stream in one of these drainages. After the middle of September, we might head back to the Firehole or Gibbon or might stay on the Gardner or Yellowstone. Regardless of season and other factors, we'll plan to fish an area with abundant and not too spooky mid-size trout, rather than a handful of monsters, and we'll try to fish an area we don't expect to be very crowded, though if our clients have limited mobility or are here early in the summer when only a couple places are clear enough to fish, we may need to fish near other anglers. Full-day or half-day trips are possible, and both make a great deal of sense. On half-days, we'll generally target medium-sized sized fish the entire time. On full-days with an entire party of beginners, we'll probably fish one of our Beginner Brookie spots in the morning (see the tab above), then fish a larger and more challenging stream later. On full-day trips where one member of the party is a beginner and the other has at least some experience, we might spend all day fishing more challenging waters, with the guide spending most of his time with the beginner. Meeting times for full-day trips will range from 6:00AM (for a handful of trips in late fall) to 9:00AM at Parks' Fly Shop, with these times shifting somewhat if we are meeting you in Yellowstone Park. For half-days, we might meet during the same timeframe or sometime in early afternoon. Afternoon meeting times are more likely before the middle of July than at any point after. We will either meet you at our shop, if you are staying in Gardiner, or somewhere in Yellowstone Park near our fishing destination, if you are staying in Yellowstone Park or in Cooke City, Silver Gate, West Yellowstone, or another entrance community besides Gardiner. While not our main quarry with beginners, rookies sometimes tie into a very nice brown trout on late summer or early fall Yellowstone River half-day float trips. Most of the year, Yellowstone River float trips are terrible choices for beginners. To regularly catch lots of trout, the Yellowstone usually requires accurate casts, good line management, precise hook-sets, and many, many casts. Moreover, fishing the Yellowstone is very fast-paced for most of the season, which tends to overwhelm less-experienced anglers. This adds up to mean that we hate taking rookies on the Yellowstone most of the season, because they usually do very poorly. In late summer through early fall, generally from sometime in August through early October, the situation is very different, with several factors coming together to make Yellowstone River float trips a decent beginner option. First, the river is low enough that precise casts are not required on certain sections of river, but the water is still warm enough and high enough that the fish are aggressive. Second, the mountain whitefish are preparing to spawn at this time and so are feeding aggressively. Finally, at this time both trout and whitefish are often eager to eat aquatic insect larvae and nymphs as well as baitfish imitations fished under strike indicators (fly fishers' fancy term for bobbers), which is the least-challenging angling technique that works on the Yellowstone. Therefore, during this ONE time of year, beginners can catch a lot of solid fish on river float trips, with only a few minutes of dry-land instruction required beforehand. 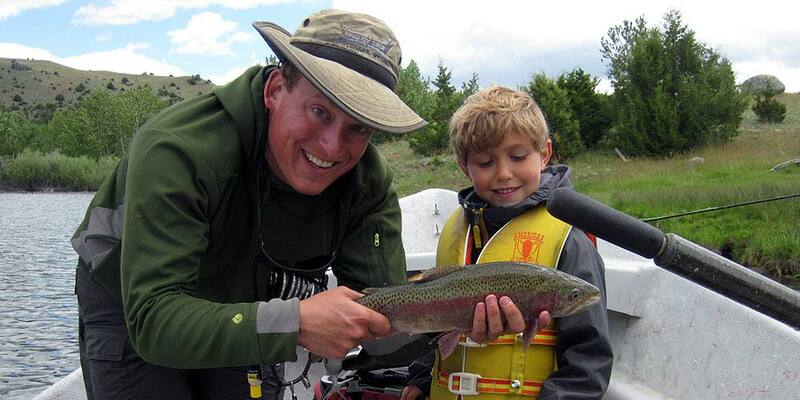 There is one big catch: beginners generally do not catch very many trout on these trips. Instead, the predominant quarry for them (unlike for experienced anglers) is whitefish. If you are familiar with mountain whitefish and do not like catching them, any of the other beginner fly fishing trips discussed on this page will be a better choice for you. Even in late summer and early fall, fishing the Yellowstone River from our drift boats is more physically demanding from a casting perspective than fishing on foot. The rods and tackle are heavier and anglers need to cast more often than they do on foot. For those who have not developed proper casting mechanics or muscle memory yet, these are therefore very tiring trips. For this reason, we suggest half-day float trips for beginners, though we do take beginners on full-day floats both on the Yellowstone and other rivers, if desired. For in-depth information on our Yellowstone River float trips, check out the River Floats page. Which Beginners Should Book a Half-Day Float Trip? During this period, Yellowstone River float trips are good choices for many beginners, provided they don't mind catching primarily whitefish. The fish are usually abundant and of solid size, and the Yellowstone River corridor is scenic and usually offers view of interesting raptors (eagles and ospreys), as well as some other bird life. Another advantage many clients enjoy is the large amount of fishing time involved. We will generally drive only a few minutes to a launch point not far from Gardiner, launch the boats, and be fishing almost immediately, rather than having to drive a long way, walk a bit, then get fishing. This means that float trips probably include about an hour more time on the water than a walk-wade, even though the total duration of the trips is the same. That said, float trips are not for everyone. 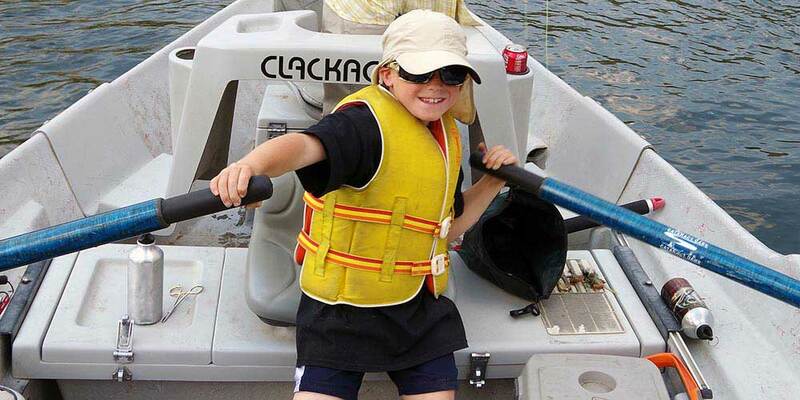 Despite the photos on this section of the page, river floats can be hard on small children, because the rods and tackle we use for these trips are somewhat heavier than those used on most walk trips, and because the high gunwales of our drift boats can be awkward for small kids to see or reach over. Those afraid of whitewater also should not take float trips, since we always see at least a little fast water no matter which section of the Yellowstone we float. As noted above, those uninterested in catching mostly whitefish should also take a different trip. River floats are also marginal choices for new anglers who wish to learn multiple tactics. All of our river float trips with beginners take place on the Yellowstone River. Most of the time we will plan to launch our boats about seven miles downstream of Gardiner and float to the top of Yankee Jim Canyon at the 13-mile marker, though there are several other stretches of river further downstream that make sense if conditions or your lodging location warrant fishing a different stretch. Meeting times vary depending on the season and the weather. In August and perhaps early September, we'll probably want to run beginner Yellowstone floats in the morning, particularly if the water is low. Such trips will generally meet between 8:00 and 9:00. Later in the fall, when air and water are both cold, we'll usually want to meet at around 10:00 or 11:00 and float through the warmest part of the day. Unless you are staying downstream on the Yellowstone, in Emigrant, Pray, Chico, or Livingston, for example, or in/near Bozeman or Big Sky, we will want to meet you in our shop for these trips. If you do happen to be staying in one of the communities just mentioned, we may be able to meet you in Emigrant or at a specific boat launch that will give you a shorter drive. We will make these arrangements when you book or a day or two prior to your trip. Public water rates apply to these trips. Private lake trips are the best chance beginners have of catching large trout, especially in the spring and early summer. This boy hooked and fought this fish himself on Lower Story Lake in early June, 2014. Walter might have been more excited that he got it than he was... Photo by his father. Three of the biggest problems with floating rivers as a beginner are that the guide is too busy rowing the boat to offer hands-on instruction, the casts usually need to be accurate, and there are no second chances: once you've floated past a good spot, there's no casting back to it, even if you missed it the first time. On private lake float trips, all of these problems disappear. When fishing the lakes we usually anchor the boats (and even get out to fish from shore from time to time), so the guide can put the oars down to offer hands-on instruction, the casts usually need not be particularly accurate, and since the boat is not zipping downstream, you can always cast back to a good spot if you miss it the first time you cast to it. Private lakes are good choices for beginners only in the spring and early summer, basically from April through June. Later in the summer, they are too warm to fish well for anyone, while in the autumn the aquatic weeds are heavy enough to frustrate beginners. The main draw of private lake fishing for beginners is the possibility of a handful of large (14 to 20+ inch) trout. The private lakes offer the largest average fish of any of our fisheries save the Missouri River, and because many of the techniques that work well for them are not too demanding, even beginners can tie into these fish. These are not numbers fisheries, however. Beginners should expect to catch somewhere between one and five fish per person on an average day (though more are certainly possible). For in-depth information on our private lake trips, check out the Private Lake Trips page. Which Beginners Should Book a Private Lake Float Trip? Private lake trips are good choices for patient beginners who want a mellow, relaxing day on the water rather than a lot of whitewater thrills or long hikes. If you like to fish with conventional gear by sitting in a chair and watching a bobber while waiting for a fish to come along, a private lake trip might be just for you, though usually lake trips are somewhat faster-paced. They are very bad choices for anglers who get bored easily or would rather catch a lot of little fish rather than a couple big ones, and for anglers who want to see a lot of scenery on their trips. They are particularly poor choices for children who are impatient. See that kid in the photo above? He got bored at 10:00AM and wanted to quit. Then he caught the fish and got a bit more excited. We still wound up cutting the day short because he was getting antsy. This large rainbow came from Upper Story Lake in April 2017, one of about fifteen fish two beginners split between them, a very good day for beginners on the private lakes. Private lake trips are best for beginners from April through June, with the best fishing prior to the middle of the month when the weeds really start to grow. We run our private lake trips on lakes on three private ranches: Merrell Lake on the Hubbard's Lodge property, Upper and Lower Story Lakes on the Story Ranch property, and Burns Lake on the Burns Ranch property. All can work well for beginners, though the Story Lakes are probably the best since they are smaller lakes that aren't as prone to wind, which makes casting easier.These lakes all require additional access fees of $80 to $100 per angler payable to the landowner. These access fees are the major reason few anglers choose to fish these lakes, since they add dramatically to the cost. On the other hand, Montana fishing licenses ($50 for nonresidents for two days as of 2018) are not required, which helps. Typically, we'll meet for these trips between 7:00 and 8:00 in the morning, though in early April we might push this back to 9:00 if it has been cold. Most of the guides we use on these lakes reside in Livingston, Montana, so we'll probably ask you to meet your guide near Emigrant, Montana (halfway between Gardiner and Livingston) if you'll be fishing Merrell or Story Lakes, or in Livingston itself, if you'll be fishing Burns (which is east of Livingston). Private water rates apply to private lake float trips. Walk/float combo trips are the best way for beginner anglers to both have the opportunity to learn how to fly fish on a small stream where the guide can offer hands-on instruction and to enjoy fast-paced dry fly fishing from a moving drift boat on the Yellowstone River, all in a single day of fishing. While we sometimes get out of the boat to fish on foot on any of our float trips, this isn't what our combo trips are about. Instead, combo trips are a half-day walk & wade trip in Yellowstone Park in the morning, followed by a half-day float trip on the Yellowstone River in Montana after lunch. Because these are very different fisheries, clients who book these trips get to see the widest range of fishing over a single day of any of our clients. For beginners, our combo trips usually begin with a morning "Beginner Brookie" trip, with a float trip on the Yellowstone after lunch. This allows us to work on basic casting and fishing techniques early, with a lot of aggressive and beginner-friendly fish to get the numbers up right away, followed by much more challenging fishing for medium-sized fish after lunch. Unlike our half-day beginner float trips discussed above, we will generally float a a turbulent and fast-flowing stretch of the Yellowstone after the morning walk & wade "basic training," which is more challenging to fish than the whitefish water but is more likely to produce good numbers of trout on dry flies. To learn more about our walk/float combo trips, check out the Walk/Float Combos page. Who Should Book a Beginner Walk/Float Combo Trip? Beginner walk/float combos are only suitable for people who love to fish but are just getting into fly fishing and want to learn/experience as much as they possibly can in a single day and for less-serious anglers who are positive they want a long day with some nice scenery and whitewater mixed in with the fishing. These trips are considerably more expensive and also typically a bit longer than our normal full-day trips, and as such those who do not want a long, serious day of fishing will find themselves wearing out in the middle of the afternoon when we're still only halfway through the float trip portion of the day. On the other hand, if you are the sort of person who LOVES to fish or LOVES to soak up outdoor experiences even if they wear you out, a walk/float combo can't be beat except by booking multiple days of guided fishing. Please note that we do not take clients younger than age 12 on walk/float combo trips. We find that younger anglers, even if they are very eager for the experience, just get too tired for combo trips to make sense. All of our walk/float combo trips for beginner clients start with a morning session in Yellowstone Park and end with an afternoon float trip on the Yellowstone River. Most of the time, we'll visit one of our "beginner brookie" destinations in the morning, probably one involving a shorter hike than most (to cut down on travel time), then float one of the first three half-day float sections of the Yellowstone, usually the first section downstream of Gardiner (again, to cut down on travel time). When one member of the party is experienced, or if both members have had previous casting instruction but have not actually fished much or at all, we may fish on foot on the Gardner or Yellowstone River in the morning rather than hitting the beginner brookies, but this is uncommon. Virtually all walk/float combo trips meet at Parks' Fly Shop between 7:00 and 8:00 in the morning, since the shop is between our morning fishing destination in Yellowstone Park and our afternoon fishing destination outside the park. While we offer walk/float combo trips from the end of the Yellowstone River's spring runoff in late June or early July through mid-October, for beginners they are only a good choice from the end of runoff through mid-August, when both beginner brookie fishing and afternoon float fishing on the Yellowstone can both be expected to be good. Walk/float combo trip rates apply.